What she might not take into account is that (a) some kinds of marketing are not as useful as others, (b) what’s best for your book is unique to your book, (c) nobody can know for sure what that is, and (d) even when a book is successful, it’s nearly impossible to know which—if any—of your promotion efforts had anything to do with it. Not only is there no magic formula, it’s possible that some kinds of marketing are pretty much pointless for your book. If you hate the idea of maintaining a website, it might be enough to create a one-page site that requires minimal maintenance. It’s not hard, and you can do it for free at WordPress or Blogger. A web page is helpful to potential reviewers, to teachers or librarians who might order your book or ask you to visit, and to readers who want to know more. If your publisher gives you a page, that might suffice. If you are self-published, a web page is more important. Set up a page with information about you and your book, links to venders, and contact information, and you’re set. Discussion questions add good value. Updates in the first months can be limited to quotes from good reviews and a list of awards and honors. Posting the dates and places of personal appearances, guest posts, and interviews is optional. Blogging is another whole question (see next item). If you don’t have content to offer that goes deeper than an ad for your book, there is little point in blogging (that is, writing essays or reviews at regular—or irregular—intervals and posting them at your site). A case in point: sales of my adult nonfiction book are driven by my weekly blog posts of professional advice to writers and editors. In contrast, I have no advice or expertise to offer at the website of my middle-grade novel, so I don’t blog there. Twitter and Facebook might very well fall into the “useless” category for your book. In my own experience, Twitter has proven to be a powerful marketing tool for my adult nonfiction book, because with minimal effort I’m able to give my followers advice, job-related humor, and links to useful articles (including my own blog posts). I tweet two or three times a week; my 4,000 followers retweet me to many thousands of their followers; and every week I gain 20 to 40 new followers who are perhaps learning about my book for the first time. Fiction writers may have less to offer in Twitter and Facebook content. How many ways can you say “Buy my book” and still interest someone who has already read it? I know that superstar novelists have big followings and make use of these platforms to gain more. And if I ever finish my killer paranormal YA crossover novel, I’ll try hard to entertain my new hoards of fans, who will be eager to hear what I ate for breakfast and what I’m wearing to the premier of the movie version. But if you’re unknown and your book is a quiet literary novel or your young audience isn’t online, keeping up any kind of interest in it on Twitter might be a tough sell. Building a following on Twitter from nothing is difficult. Many writers with big Twitter and Facebook followings are those who already have a lot of attention from media because they won a major award or there’s a movie based on their book or they happen to be celebrities in the first place. My adult nonfiction book was published in connection with a perennial best-seller (The Chicago Manual of Style) that gave me an instant following. I continue to ride its coattails, in that CMOS retweets me and promotes my blog posts. So if you think you might get a sudden media blast that will result in readers seeking you out, be prepared by setting up accounts. But unless your book is the type that collects hoards of screaming little fans and you are the type of writer who loves feeding them, consider skipping this type of promotion. When a new book comes out, all your friends are going to ask about tours and signings and panels, and this might be the spotlight you’ve always dreamed would shine on you. Go for it! It could be the most fun you ever had. But don’t count on it leading to significant sales. My bet is that most writers spend more money on these events (traveling, printing cards and posters, buying something to wear) than they ever regain as a direct result in royalties. I’ve had bookstore events where not a single person showed up. Even if 20 people come to your signing (a great turnout) and every last one of them buys a book (not likely), multiply that times your royalty and do the math. School visits have greater potential, not only for great personal satisfaction in doing something wonderful for children, but also for selling copies of your book. Although you will have to invest some money (and a lot of precious time) preparing, if you arrange things right, sales before and at the event can be significant, and you can charge a fee as well. There’s also potential for more appearances and sales as a result of recommendations you’ll get from all the teachers and librarians you charm. I have not found it difficult to promote Eddie’s War on various review sites where guest posts are welcome. I simply emailed the host and asked, and about half the time, the answer was yes. However, only once or twice has my post seemed to reach many readers. Considering the amount of time I put into writing the essays, I’ve come to believe that it’s best to be choosy about where you guest post, since it’s potentially the most labor for the least return. When someone contacts me asking me to write a guest post, I don’t hesitate to ask about the size of the audience. If the blogger says she doesn’t know, I politely decline. In sum, I can think of only two good reasons to market your book through social media. First, market your book if you have the time to do the work and you believe in the shotgun effect: that reaching as many people as possible has the potential to lead to an interview, a review, and eventually actual sales—even if many of your individual efforts (a tweet, a guest post, a night at your public library author fair where only two people stop at your table) fail to hit any target. And second, market your book if you enjoy doing it. Writers of children’s books like to write: you might find joy in posting your thoughts in a blog. There’s plenty of fun and education in engaging on Twitter and Facebook, even if your own stats stay flat. (For more on this, read Susan Bearman, “Twitter for Writers,” Prairie Wind, Spring 2012.) And lots of us glory in standing in front of a few customers at a bookstore or book fair, being “The Author,” even if hardly anyone buys the book. —Choose the kind of chore you like best and forget about the rest. You might hate school visits, but love crafting a blog post. Others might find the whole online scene annoying but blossom in the classroom or library in front of a crowd. Go with your strengths and have fun. —Resolve to quit marketing after a reasonable launching period, say a year. Few professional reviewers will touch a title that’s more than a year old anyway, and by that time it will no longer eligible for awards and “Best” lists. From that point on, if your book has merit it will continue to quietly gain readers by word of mouth and by viral proliferation of online lists and links. —Use all the time you’re saving to make your next book your best book. Reprinted from SCBWI-Illinois, Prairie Wind (Fall 2012): 54. I’m an editor who craves (and requires) an orderly chain of command when handling a manuscript. Up to this point, I’ve worked with a limited staff: me, a copyeditor, and a designer. We’re expanding the journal. It is now an online publication. Now, I’m working with others in the office who are in the habit of distributing manuscripts and video files to a whole group of people simultaneously for feedback. I hate this disorderly process, which seems counterproductive. How should I impose order? Is there a protocol you can lay out to guide me (and others) in work environments where manuscripts are flung around via e-mail for an editing bacchanalia? With the expansion of your journal comes a chance—and a responsibility—to establish procedures. It’s normal in publishing for copy that must be seen by many eyes to route sequentially, with each person marking corrections and signing off before sending it to the next person on the list. This ancient tradition is still so firmly engrained that many houses (including the University of Chicago Press) still walk a single copy of some documents around the house on paper. The problem with readers vetting documents simultaneously is just as you describe: a nightmare of version control. I can’t think of any efficient way for someone to take all the versions and sort out which corrections and suggestions to accept, especially when readers have worked at cross purposes and contradicted each other, and no one has seen anyone else’s suggestions. Whether you do it by means of a locked file sent by e-mail attachment (so all changes are tracked by author) or by a paper copy with a routing slip attached, the idea is to allow only one reader at a time. Start with whoever might make the most changes on that particular document: the writer, the acquirer, the marketer, the designer. List others in whatever order makes the most sense for that type of document, with the copyeditor near the end to clean up all the emendations, query anything contradictory, and find answers to questions. Since not everyone vets everything, make up some template attachments that show the routing order for each type of document (catalog copy, art, proofs). Next to each name add blanks for a signature and the date signed. (Having to add the date gives the reader a small incentive not to sit on the copy—later, it will always be obvious where a holdup occurred.) Note the date at which the copy must get back to the one who routed it. You don’t say what your place is in the chain of command, but if you aren’t able to enforce procedures yourself, and if your boss is reluctant, suggest appointing a managing editor. Ultimately I’m confident that your staff will appreciate having a routine as much as you do. And all that new efficiency will leave more time for carousing at office parties. A few months ago I encountered a bank of hotel elevators that made a big impression on me. This might be old hat to you,* but to me it was a wondrous invention: there were no buttons inside the elevators for choosing your floor. Instead, you chose your floor from a panel outside the elevators. You pressed 14, and a display told you which elevator to wait for. Meanwhile someone else pressed 5 and was given a different elevator. If a conference session ended and twenty people rushed the elevators, they would each pick a floor and obediently sort themselves into little groups outside their assigned elevators. Once inside, everyone was a little creeped out that there were no buttons for choosing a floor. “What if I picked the wrong floor?” someone asked. I had to admit I’d already done that. I’d had no choice but to get out on the wrong floor and ring for another elevator. Over the next few days, everyone was talking about the elevators, and nearly everyone I talked to hated them. In spite of my initial detour, I loved them. If you have six elevators and thirty people going to fourteen floors, you can either let the crowd randomly and inefficiently choose the number of elevators, floors, and stops—or you can let a nifty computer algorithm minimize the number of stops each elevator makes by assigning the elevator based on floor choice. What’s not to love? Waits are short; trips are fast. So . . . I know you can’t wait to see what cockamamie* metaphor for copyediting this inspires. 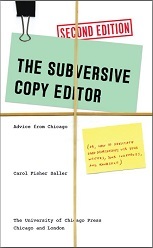 It’s this: copyeditors can improve their efficiency by devising strategies before editing begins. I’ve reviewed plenty of manuscripts where a copyeditor has gotten into deep trouble by conforming a document to house style when it doesn’t suit. A thoughtful review before barging in would have prompted doubts: is it really wise to change all book and article titles to headline casing? Will the section numbers you’re deleting be needed later? —If no particular style dominates, plan on editing to house style. —If an element is not written to house style but is clear and consistent, ask whether it can stay as is. If you have to get permission for this, your best argument (after the most obvious one of saving time) is that in changing it, you are likely to introduce errors and typos. —If an element is in a foreign style and is sloppy and inconsistent, look over all the instances of that element and devise the most efficient remedy. Don’t assume it will be your house style. There’s nothing more disheartening to a copyeditor than having to start over midway through a job in order to cut losses. There’s no quick button to press once you’ve committed to a bad choice. Better to make the right choices before you get on board. *I’m older than you, so I get to say things like that.